Ahoy buccaneer! 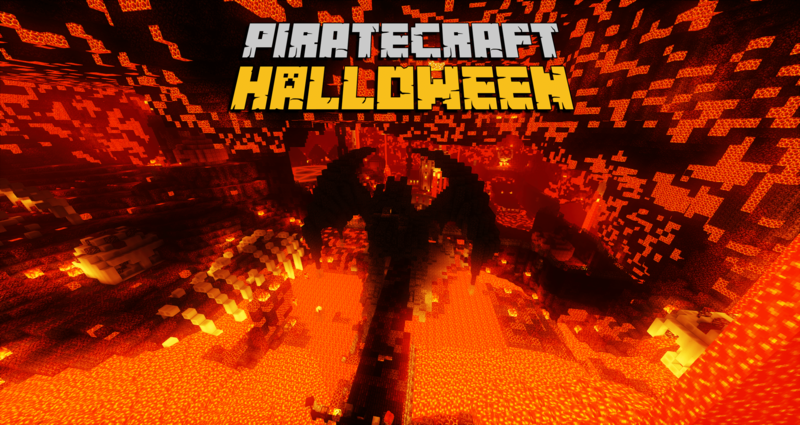 The PirateCraft Halloween event by CallieMav has opened early this year, its been alive most of this week with fiery battles between Pirates and the un-dead that have taken over the pits of PirateCraft hell! 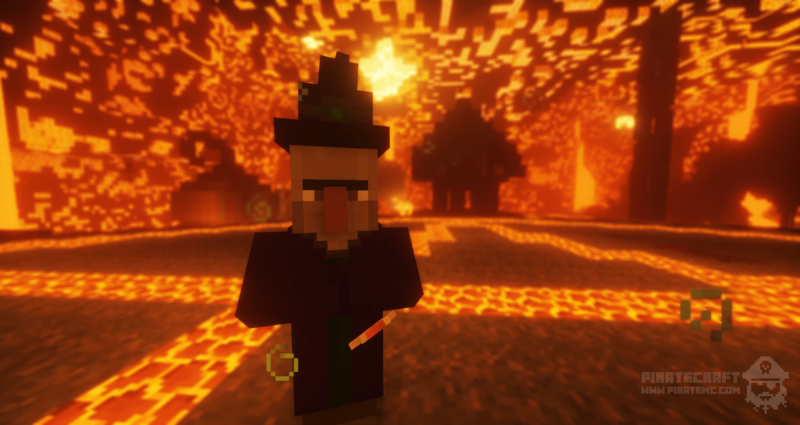 Get yourself to the event by using /warp Halloween in game, your initial spawn is PVP free but the battlefield has PVP enabled for the bloodiest of Pirate battles. 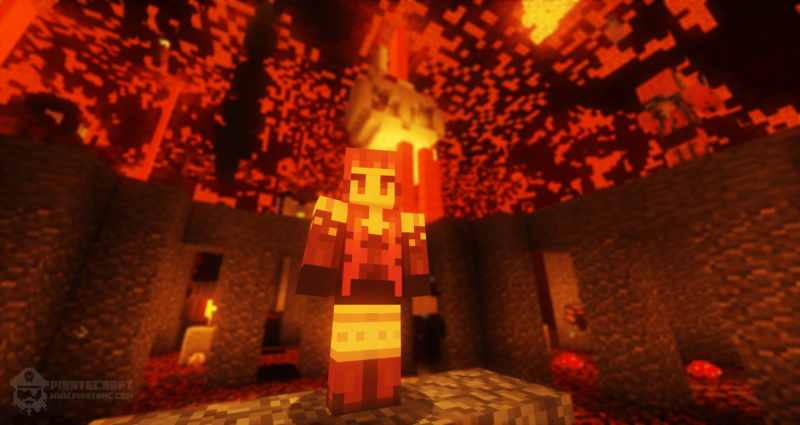 The Halloween arena has been changed dramatically this year, expanding greatly in size, and utilizing all the new 1.10 Magma, Nether Wart, Red Nether brick and Bone blocks really create a deadly atmosphere in this hellish takeover! 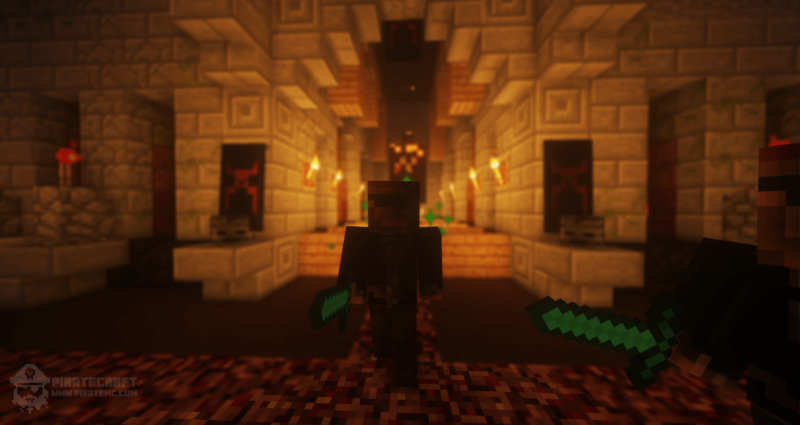 Extended Gameplay has been added this year, there are multiple parkour events leading to hidden areas, There is a treasure hunt to find all the Herobrine flags and loads of hidden areas to find. All mobs have been re-created from scratch just for PirateCraft, new mobs added, incredible new unseen skills created, new particle effects, animations and behavior of mobs, new interactive mobs (Right click them), all new item drops, custom rare items with unique powers and abilities as well as two main bosses! We will be hosting a PVP free week next week, From Monday the 1st till Sunday 16th August to allow the mob battles to be fought without player vs player, PVP will be enabled again after this PVP free week ends. The event and blog post will be continually updated as we find issues to fix and improvements that can be made, so far 29 small and large updates have happened since the event has gone live, So keep playing its being changed regularly. Don’t be shy in keeping your ideas or issues in your head, even if you have an idea for the next event we would love to hear it (I hear sleigh bells). As quite a lot of you know already, I have been running XP Boosting multipliers at peak times over the last few months, this has finally come as an event drop item! Fight Herobrine with a chance in him dropping an XP Boost token! What is this XP Boost tokens you speak of? The XP boost tokens can be redeemed at The Cove at the Chapel (behind you when you /warp cove) Each token activates an XP Boost for EVERYONE online at that time you activate the token, so make sure to get your crew on all at the same time for when you activate a token, those turning up late won’t get the boost! You are able to log off and on again once you have an XP Boost enabled. The Halloween event only has 1 XP Boost token being dropped at present, its a 1.5x multiplier that lasts for 20 minutes for everyone online at the time its activated. This is perfect for when we have a busy event happening with lots of XP being dropped by custom mobs! As usual we are running a month-long 15% off sale to celebrate Halloween! use coupon code ghostship for 15% off /donate and the Donation store when you checkout. Here’s what you came for, in glorious Technicolor from yours truly, Let me introduce to you the 7 hellish mobs, their skills and loot! 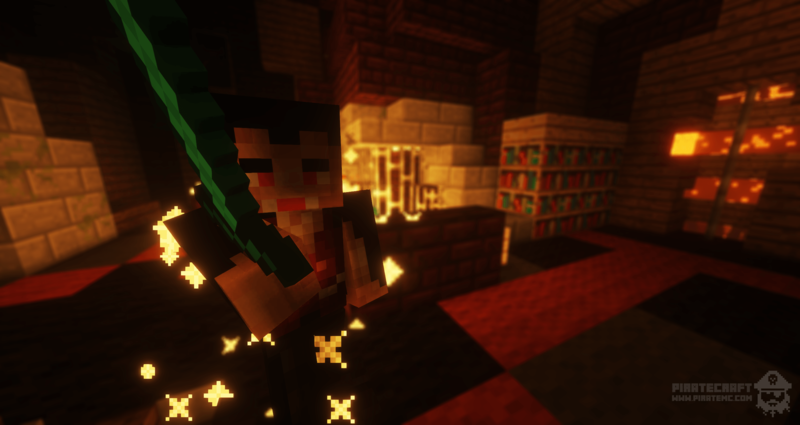 You can click on the images for a higher resolution image if you wanted a new pirate minecraft wallpaper! Jumps into air and shoots a fireball at a target pirate, then after a few seconds will jump again but launch a wither skull into your face. Has all the regular abilities of a witch, minus the black cat and the flying broom. Bloody missiles shoot out in 8 directions from vamps, don’t worry he will try and get that blood back from unsuspecting pirates. Torpedoes bloodshot heat seeking eye balls at nearby pirates to ignite them before burning up themselves. Once the vampire gets low enough HP he will turn into a Vampire Bat and fly around randomly shooting a bloody missiles. This is to allow time for the vampire to fully regenerate. If all the bats are not killed the vampire bat will return to a Vampire! Randomly when hit, the cursed landlubber will throw a fan of swords at the pirate dealing extra damage. Throws on Invisibility cloak to sneak to a new position 5 blocks from the Pirate they are attacking, and uncovers to strike! Launches a few skulls that explode on contact or after a certain amount time. Deadly to all, hope you have been practicing your ducking skills. A random teleporting fireball blazing attack, watch your back as this skill allows the Fire demon to teleport nearby, launching into the air to let loose a barrage of fireballs into your skull! Power up charge skill, once the Fire demon manages to charge up their fire blast, it may be too late for you, just jump into the lava, landlubber. Right click a Gypsy for the chance of the Fortune telling skill, this will pick 1 out of the 6 different fortunes cast on the Pirate. Most fortunes are good potion effects to help you in battle. Right click a Gypsy for the chance of getting tricked this Halloween! This Calls out 3 cultists to give you a cultist party, The Gypsy has another party to get to so disappears into another dimension. Best part of Halloween! Right click a Gypsy for the chance to summons a free Loot Chest! Be quick to right click it to get your loot, before another pirate sneaks in! Summons flaming meteors across the entire battlefield, you are wearing a helmet right? 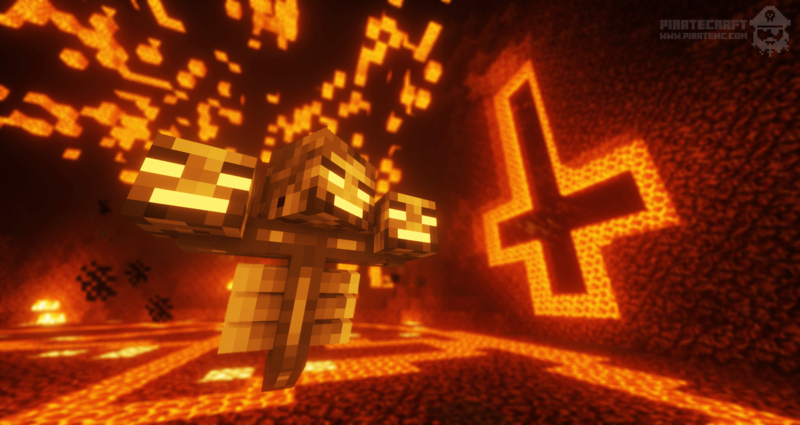 Calls out to his Spirit friends to back the ancient wither up, Spirits may be hostile. This ancient wither has figured out the skill of summoning a vibrant light beam to blast off Pirates faces, bring some pork chops for free cooking, no coal needed. Potion bomb, This flying 3 headed beast bombs potions from above, and not the good kind, You got my memo about a helmet right? Shares all items from all mobs. Summons weaker shadows of himself to mask his location as well as having a temporary crew to back up himself. Telekinesis skill to throw up-to 3 Pirates in the air, or if you are alone just you, 3 times. Duplicates nearby players at random to confuse allies and players in battle, Is that you Bob? Death from above, This attack Herobrine launches into the air sending a bombardment of Fireballs and Wither Skills your way, but don’t think you can run, he then teleports to a random Pirate in the arena! Herobrine can summon Cyclones that tear through the battlefield, get caught in one of these and you’ll be thrown around! Its not just pirates Herobrine wants, he enslaves Endermen too, using their teleport abilities to bring in blocks to the battle, this skill enslaves an Enderman to be a living End Crystal turret before committing a kamikaze explosion. 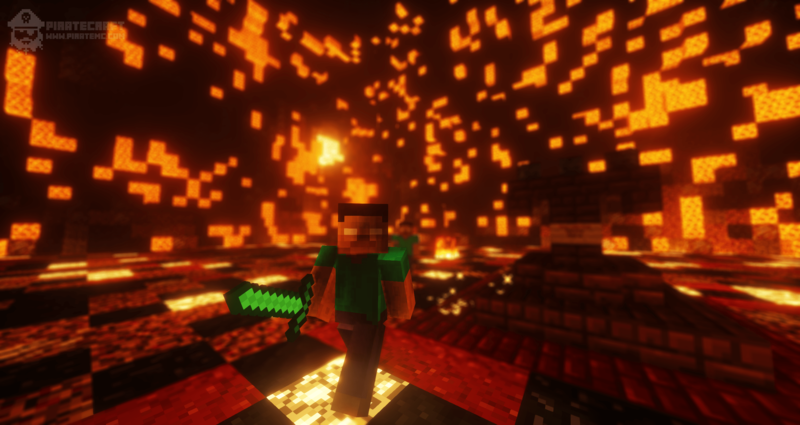 Summons dead souls from the depths of hell, enslaved by Herobrine to work for his every need, the spirits launch fireballs and wither skills at unsuspecting pirates! You can see the pattern here now, Herobrine can control all of hells beasts, Cultists will be spawned to fight for Herobrine. Skull of enemies previously crushed are charged and used as missiles, Don’t get too close, or you may ignite. This is the Hell Cyclone, but supercharged. This is the Hell Turret, but supercharged. Calls out 3 random chests. Their effects can be good, Who knows? You might get lucky..
Raining in hell? 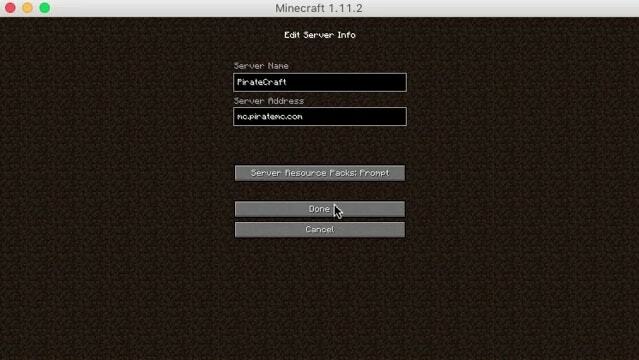 Herobrine can do that too, flaming meteor rain. These will rain down in random directions tearing up anything that gets in their path. 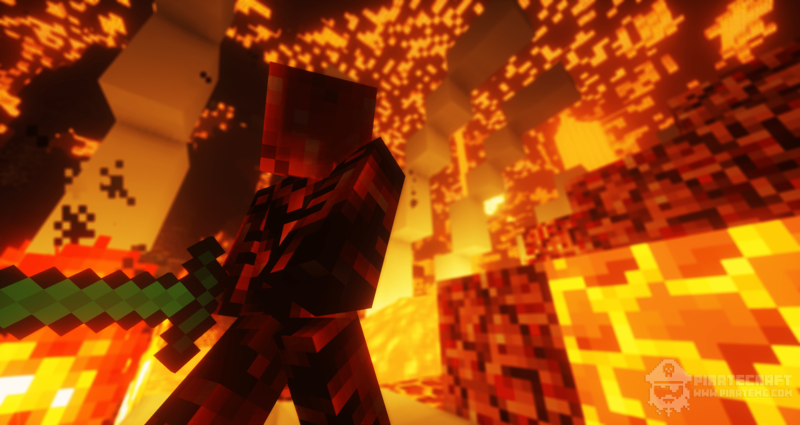 Herobrine gets angry, you wont like him when hes angry. The frenzy skill, herobrine will pick a random target, launch them across the battlefield a few times, try not to make him angry. Scorches the hell earth with obsidian, that explodes into a fiery explosion after a few seconds! PirateCraft Halloween event was brought to you by the fantastic CallieMav, Who built all the custom mobs, items, skills and updated the area! This event wouldn’t have happened without you! So Thank you very much CallieMav! It’s always a pleasure to work with CallieMav on events, so much fun! Feel free to post your screenshots and video from the event as a reply and I will add it to the blog post! This topic contains 0 replies, has 1 voice, and was last updated by GodsDead 2 years, 6 months ago.